NEW YORK — The record books will show Mary Keitany’s winning time was only the second fastest New York City Marathon run by a woman, but in reality it was a run for the ages. On a day with ideal conditions for running fast (47 degrees and sunny with very little wind at the start) and after a pedestrian first half marathon of 1:15:50, Keitany blasted the second half marathon in 66:58, winning the 2018 TCS New York City Marathon by a massive 3:14 in 2:22:48 — only Margaret Okayo went faster, clocking 2:22:31 back in 2003. It was Keitany’s fourth New York City crown. Let us try to put that in perspective for you. The fastest half marathon ever run by a US woman is 66:57 (Kara Goucher) but that came on an aided course. The official US half marathon record is 67:25 (Molly Huddle). Keitany’s splits were amazing. Mile 14 in 5:15, Mile 15 in 5:08, but she didn’t take the lead until a 5:09 for mile 16. Then it got silly. A 4:55 downhill mile 17 still did not put her all alone as Netsanet Gudeta and Rahma Tusa of Ethiopia were still with her. 4:58 for mile 18 dropped Gudeta and when Keitany followed it up with a 4:55 for mile 19, she finally totally cracked Tusa, who was 26 seconds back. At mile 20 (5:01), Keitany led by 53 seconds and the final 10k was a coronation of her greatness. 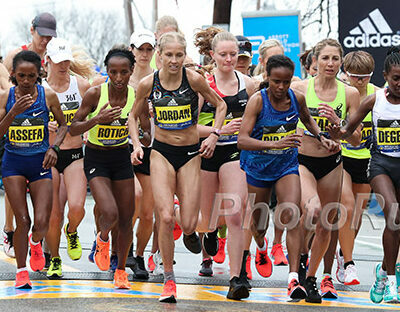 Rio Olympic 5,000m champion Vivian Cheruiyot and defending champion Shalane Flanagan came from the second pack to finish second (2:26:02) and third (2:26:22) after deciding not to go with the lead pack when it emerged in the second half of the race (a wise decision; Gudeta would wind up dropping out while Tusa faded to fifth). Flanagan’s time of 2:26:22 was 31 seconds faster than what she ran to win last year and is the second fastest time ever put up by an American in New York (Goucher holds the American course record at 2:25:53). Three other Americans joined Flanagan in the top 10 as Molly Huddle lowered her pb from 2:28:13 to 2:26:44 to place fourth (2:26:44 is the third fastest time ever recorded by an American in NYC), Des Linden was 6th in 2:27:51, and Allie Kieffer lowered her pb from 2:29:39 to 2:28:12 to place 7th. It was the first time the U.S. put three women in the top six since 1978. Our quick take analysis and then results appear below. For most runners, winning the New York City Marathon by 3:14 with a 66:58 second half would rank as the crowning achievement in their career. But, as she has proven over and over, Mary Keitany is no ordinary runner — this is a woman who ran 2:17:01 in London last year. This is a woman who won New York by 3:35 in 2016. Keitany was already a marathon legend, but at 36, some questioned whether she was still on the top of her game, especially after she was upset by Flanagan in New York last year and struggled to a fifth-place finish in London in April. She made those doubters look foolish as it was clear by today’s performance that Keitany is as good as she ever was. In the discussion of the greatest female marathoner in history, it’s Paula Radcliffe, with her ridiculous 2:15:25 world record, at #1, and Keitany at #2. There is not a close third. Update: okay, as veteran journalist Phil Hersh points out, there actually is a close third. Catherine Ndereba was a stud, but we still have Keitany (whose 2:17:01 PR dwarfs Ndereba’s 2:18:47) slightly ahead. @letsrundotcom Have you already forgotten about Catherine Ndereba? Two world titles and a silver. two Olympic silvers. Four Bostons. Two Chicagos. World record. Let’s try to put in perspective just how good Keitany was today. We spoke to an agent at the finish line who pointed out that even if you started the American women at halfway and asked them to race Keitany from that point on, they would have been overmatched. And those American women included the reigning NYC champ, the reigning Boston champ, and the AR holder in the half marathon. In fact, almost everyone in the women’s field would have been overmatched. Aside from Keitany, only Mamitu Daska (66:27) and Netsanet Gudeta (66:11) have ever run faster in an open half marathon than Keitany ran for her second half today. Heck, it wouldn’t have been easy for the Americans to hang with Keitany for even 10 kilometers. 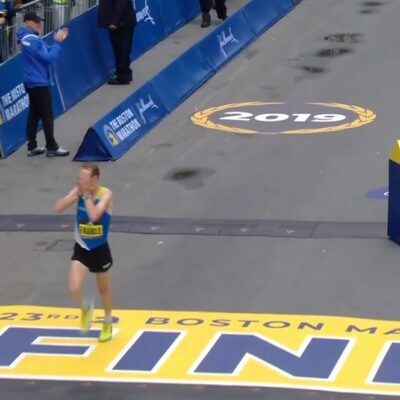 The American record for 10k on the roads is 30:52, set by Flanagan two years ago. Keitany split 30:53 from 25k to 35k today (though, admittedly, that section is a net downhill of roughly 100 feet). Prior to today, Mary Keitany was known for going out extremely fast but today it was her incredible finish that won her accolades. Remember, this is a woman who, in 2011, ran her first half in New York in 67:56, amassing a lead of 2:24 only to blow it and finish 3rd. 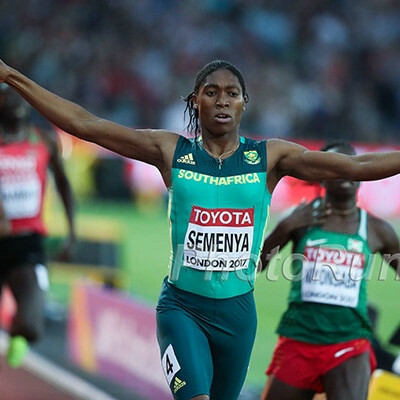 This is a woman who last year in London went out in 66:54 and held on to run 2:17:01, and this year in London went out in 67:16 only to crater with a 77:11 second half. But Keitany has learned from her past mistakes, and knew that she did not want to go out too hard as the second half of the course in New York is tougher than the first. 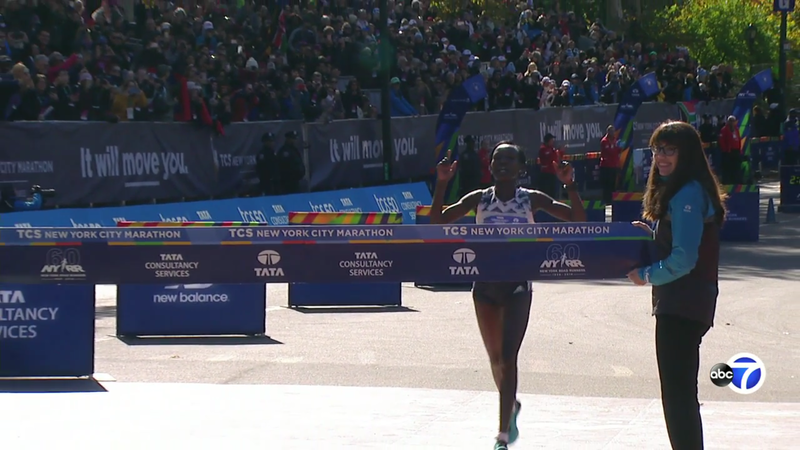 Keitany’s approach worked perfectly, and despite going out in 75:50, she came just 17 seconds shy of Margaret Okayo’s 2:22:31 course record, becoming just the second woman to break 2:23 in New York. She also became just the second woman, after Grete Waitz, to win four NYC titles, though Keitany is not even halfway to Waitz’s record nine victories. Des Linden was only the third American here today, but she didn’t run poorly. As she noted during the press conference, she ran 72:00 for the second half of the marathon. She ran 71:48 at the Rock ‘n’ Roll Half Marathon in Philly in September, so splitting 72:00 on the rolling second half of New York is pretty good for Des. But this type of race, which turned New York into a half marathon, is not her best type of race. To be the first American today, Des would have had to run 70:32 for the second half of the race. Her half marathon PR is 70:34. An American who ran faster the second half of the race than Des was Allie Kieffer, who finished one spot behind Des in 7th in 2:28:12. Kieffer ran the second half in 1:11:38. Last year, Allie Kieffer turned a lot of heads by placing 5th in 2:29:39. This year she ran faster but placed lower. Kieffer was actually with Des through nine miles but when the leaders started picking it up at one point, Kieffer dropped back and was left to lead the next pack. Mary Keitany just GODZILLA’D New York. NY Marathon – AMERICANS GO HOME DEVASTATED!!!!! Why didn’t ESPN cover the US runners better? Mile 2: 5:41 Linden now starts to push a bit during mile 3. 2nd pack is 36 seconds back. They lost 14 seconds on that mile! Mile 18 went down to 2 in lead pack and then just after 18 down to 1.